Millions of microbial and animal species live and make up soils, from bacteria and fungi to mites, beetles and earthworms. The immense diversity in soil allows for a great variety of ecosystem services that benefit the species that inhabit it, the species (including us) that use it, and its surrounding environment. 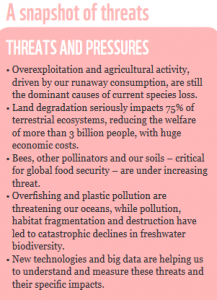 The WWF’s ‘risk index’ for the globe — indicating threats from loss of above-ground diversity, pollution and nutrient over-loading, over-grazing, intensive agriculture, fire, soil erosion, desertification and climate change. It shows India among countries whose soil biodiversity faces the highest level of risk. Coloured red on the Atlas, these include Pakistan, China, several countries in Africa and Europe, and most of North America. Since 1960, the global ecological footprint has increased by more than 190%. India’s per capita ecological footprint is less than 1.75 hectares/person (which is in the lowest band, among countries surveyed). However its high population made it vulnerable to an ecological crisis, even if per-capita consumption remained at current levels, the WWF warned. 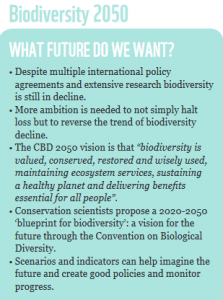 A key aspect of this year’s report is the threat to soil biodiversity and pollinators such as bees. 150 million bee colonies were needed to meet the pollination requirements of about 50 million hectares of agricultural land in India, whereas only 1.2 million colonies are present. 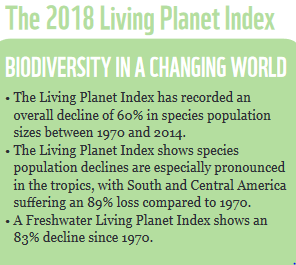 The population of fish, birds, mammals, amphibians and reptiles has dwindled by an average of 60% from 1970 to 2014, and fresh-water species have declined by 83% in the same period. Globally, the extent of wetlands was estimated to have declined by 87% since 1970. India’s first container vessel movement on the river Ganga (National Waterways-I) has began with the Inland Waterways Authority of India transporting container cargo belonging to the food and beverages giant PepsiCo (India) from Kolkata to Varanasi. The vessel MV Rabindranath Tagore is transporting 16 containers equivalent to 16 truckloads of food and snacks through the river Ganga, and will reach Varanasi in 9-10 days. It will make its return journey with fertilizers from IFFCO that will be procured from its Phulpur plant near Allahabad. The cargo movement to the east and northeastern states will become easier with the new mode of transportation through waterways. The container cargo transport reduces handling cost, allows for easier modal shift, decreases pilferage and damage, besides enabling cargo owners to lessen their carbon footprints. The central government is developing NW-1 (River Ganga) under Jal Marg Vikas Project form Haldia to Varanasi (1,390 km) at about Rs 5,369 crore with the technical and financial assistance from the World Bank. The project would enable commercial navigation of vessels with a capacity of 1,500-2,000 Tonnes. India and Japan Monday concluded a $75 billion Bilateral Swap Arrangement (BSA), a move that will help in bringing greater stability in foreign exchange and capital markets in the country. The rupee has depreciated the most among Asian currencies amid emerging market volatility triggered by rising US interest rates, pricier crude, geopolitical concerns and intensifying protectionism and trade wars. It has fallen over 13% since start of 2018, having recovered from 74.48 to the dollar earlier this month to close at 73.41. India has taken several steps to contain its current account deficit, which could swell to an estimated 2.8% of GDP, and is seen as the root cause of rupee volatility. 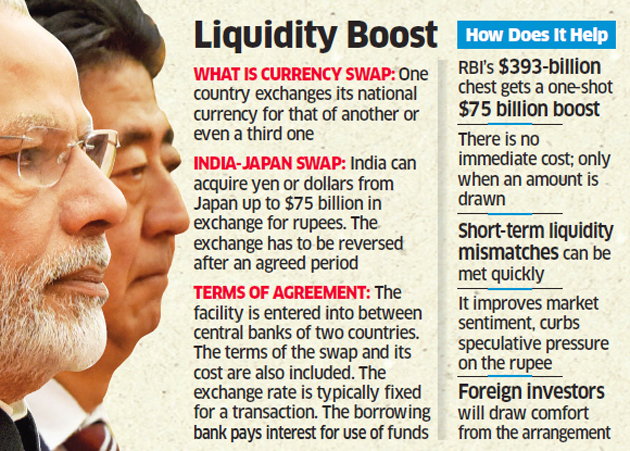 Conversely, Japan can also seek dollars from India in exchange for yen. Some of the measures taken by the government to attract foreign capital include the review of certain restrictions on FPI investment in debt. It is promoting exports through hike in customs duty to curtail imports of non-essential items, relaxations in the policy for external borrowings and issuance of offshore rupee bonds (Masala Bonds) etc. The BSA will allow India to pay for any loans that it borrows from Japan in Indian rupees, rather than borrowing a third-party acceptable currency like the US dollar. It will also allow the country to make any interest or principal payments in domestic currency. This, in turn, will increase the demand for the national currency in the forex market, making it more valuable, and stabilizing the rupee-to-dollar ratio. This facility will enable the agreed amount of foreign capital being available to India for use as and when need arises. 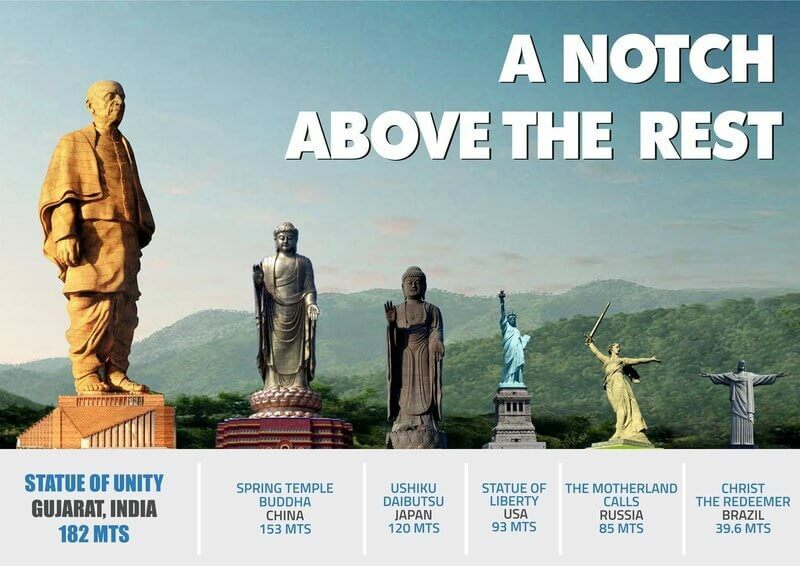 The Prime Minister will dedicate the world’s tallest statue, the “Statue of Unity”, to the Nation, today on October 31, 2018. The monument along with its surroundings occupies over 20,000 square metres, and is surrounded by a 12 square km artificial lake. It is the world’s tallest statue with the height of 182 metres (597 ft) designed by Ram V. Sutar and designed and executed by Larsen & Toubro. The total height of the statue from its base will be 240-metre consisting base level of 58 meters and statue of 182 meters. It is constructed with steel framing, reinforced cement concrete, and bronze cladding. The statue needed 75,000 cubic metres of concrete, 5,700 tonnes of steel structure, 18,500 tonnes of reinforced steel rods, 22,500 tonnes of bronze sheets for construction. Sardar Vallabhbhai Patel Rashtriya Ekta Trust (SVPRET), a special purpose vehicle was established by the Government of Gujarat for its construction and the outreach programme was carried out across India starting December 2013. The sail training ship of Indian Navy, INS Tarangini based at Kochi, returned after a seven month long sailing across the world. The Voyage named “Lokayan 18” was flagged off on 10 Apr 18 from Kochi in INS Tarangini. During the voyage, the ship has proudly ‘shown the flag’ and highlighted the diverse culture of India across 15 ports in 13 countries. The ship sailed across the Arabian Sea, Red Sea, Suez Canal, Mediterranean Sea, Strait of Gibraltar, North Atlantic Ocean, Bay of Biscay, English Channel and North Sea, right up to Norway before commencing her homeward passage back to Kochi. The ship also participated in the culminating event of the ‘Three Festival Tall Ships Regatta’ at Bordeaux, France. Over the years, INS Tarangini has been extensively deployed for long voyages away from her base port of Kochi, which includes one circumnavigation of the globe (2003-04) and three previous ‘Lokayans’ (2005, 2007 and 2015). INS Tarangini is a three masted ‘square rigged’ barque which carries a total of 20 sails. She is the First Sail Training Ship in Indian Navy and was commissioned on 11 Nov 1997. In her 21 years of glorious service, she has sailed over 2,20,000 nautical miles to date across the world’s oceans. She is the first of two Sail Training Ships in the First Training Squadron, the other being INS Sudarshini. The primary role of these Sail Training Ships is to develop character and professionalism, as well as inculcate the qualities of initiative, courage, resilience and spirit amongst the Sea Trainees. The ship also imparts practical training to them, primarily on navigation, sailing and seamanship. Uncontrolled consumption has decimated global wildlife and has triggered a mass extinction and exhausted Earth’s capacity to accommodate humanity’s expanding appetites, warned WWF. From 1970 to 2014, 60% of all animals with a backbone — fish, birds, amphibians, reptiles and mammals — were wiped out by human activity. WWF said all this in its “Living Planet” report, based on an ongoing survey of more than 4,000 species spread over 16,700 populations scattered across the globe. For freshwater fauna, the decline in population over the 44 years monitored was a staggering 80%. Regionally, Latin America was hit hardest, seeing a nearly 90% loss of wildlife over the same period. Measured by weight, or biomass, wild animals today only account for 4% of mammals on Earth, with humans (36%) and livestock (60%) making up the rest. Even if we manage to cap global warming at 1.5 degrees Celsius coral mortality will likely be 70 to 90% said the report. But the onslaught of hunting, shrinking habitat, pollution, illegal trade and climate change — all caused by humans has been too much to overcome, he acknowledged. 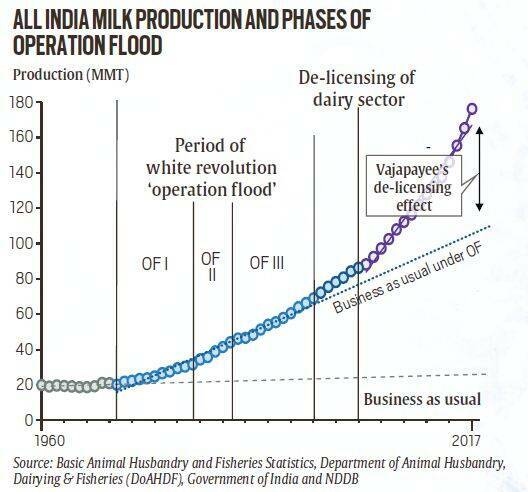 This ‘great acceleration’ as termed by WWF is marked by exponential growth over the last 50 years in the use of energy, water, timber, fish, food, fertilizer, pesticides, minerals, plastic. The Maharashtra state cabinet has approved the formation of MahaHousing (Maharashtra Housing Development Corporation), a dedicated housing corporation to implement the PMAY in the state. It plans to build 19.40 lakh houses by 2022. A separate mechanism was needed to speed up the process of building houses in the stipulated time frame. The projects are being implemented by the Housing Department, Maharashtra Affordable Housing and Development Authority (MHADA), and local civic bodies. The projects also include public-private partnership and joint ventures. Projects for economically backward classes, low income and middle income groups will get an FSI (floor Space index) of 2.5, while those in green zones or no-development zones will get 1 FSI. MahaHousing will work till 2022, or till the time PMAY continues. The CM will be its president, while the Housing Minister will be the additional president. A non-government member will be joint president. A government-appointed CEO will work as its managing director. The entire staff of the corporation will be outsourced. Funding for MahaHousing will be raised from share investment by MHADA, Slum Rehabilitation Authority, Shivshahi Punarvasan Prakalp Ltd. and other interested government bodies. Besides, the corporation is allowed to raise money through loans from banks and financial institutions. Every day about 93% of the world’s children under the age of 15 (1.8 billion children) breathe polluted air that puts their health and development at serious risk, the WHO said in a new report. It attributed deaths of about 600,000 children under 15 years of age in 2016 to the joint effects of ambient and household air pollution. It reveals that when pregnant women are exposed to polluted air, they are more likely to give birth prematurely, and have small, low birth-weight children. Air pollution also impacts neurodevelopment and cognitive ability and can trigger asthma, and childhood cancer. Children exposed to high levels of air pollution may be at greater risk for chronic diseases such as cardiovascular disease later in life. The report was published on WHO’s first ever global conference on Air Pollution and Health. What makes children more Vulnerable? They also live closer to the ground, where some pollutants reach peak concentrations at a time when their brains and bodies are still developing. In addition, newborns and small children are often at home. If the family is burning fuels like wood and kerosene for cooking, heating and lighting, they would be exposed to higher levels of pollution. The Odisha government has launched the Early Warning Dissemination System, the first-of-its-kind technology in India, to simultaneously warn coastal communities and fisherfolk about impending cyclone and tsunami through siren towers. The Union Home Ministry has inaugurated the two-day conference on “CCTNS–Good practices and Success Stories” organised by National Crime Record Bureau (NCRB). The CCTNS is a project under Indian government for creating a comprehensive and integrated system for effective policing through e-Governance. The system includes nationwide online tracking system by integrating more than 15,000 police stations across the country. The project is implemented by National Crime Records Bureau. The concept of CCTNS was first conceived in the year 2008 by the then Home Minister, P. Chidambaram in the aftermath of 2008 Mumbai attacks. CAS was developed by the Bangalore based IT firm, Wipro. It needs to integrate different software and platforms followed by different states and to digitise records of those states which have not digitized their police records. The project also involves training of police personnel and setting up of citizen portal to provide services to citizens. These crackers have been named as SWAS, SAFAL and STAR. SWAS crackers eliminates usage of (KNO3) Potassium nitrate and Sulphur with consequent reduction in particulate matter (30-35%) SO2 and NOx. It has matching sound intensity with commercial crackers in the range of 105-110 dBA. SAFAL has minimal usage of aluminium (only in flash powder for initiation) with consequent significant reduction in particulate matter(35-40 %) compared to commercial crackers. It has matching sound intensity with commercial crackers in the range of 110-115 dBA. Also functional prototypes of flower pots for substitution of BaNO3 (Barium nitrate) by low cost eco-friendly materials have been developed with significant reduction in particulate matter (30-35%). STAR has the capability to eliminate the usage of KNO3 and S with a consequent reduction in particulate matter (35-40 per cent), SO2 and NOx. CSIR-CEERI, being an electronics laboratory, is developing safe and pollution free technology of electronic crackers (E-crackers) to meet latent social aspiration of enjoying fireworks. It includes various products like E-Ladi, E-Anar, system for E-cracker show etc. At present CSIR-CEERI is ready with the laboratory level prototype of E-Ladi. E-Ladi is based on high-voltage electrostatic discharge to generate light/sound effect. It is triggered by providing heat to the thermal switch which will give the excitement of firing the conventional cracker. The E-Ladi is also programmable to give various light/sound effect. High voltage generator is capable of producing very high voltage using the concept of tesla coil. These pods are connected in parallel to achieve desired light/sound pattern. The controller block consists of a pulse generator and a solid state device based circuit to control the switching of these pods. The second version of this prototype will include compact form factor and thermal actuation arrangement. CSIR-NEERI has also planned to use area source control through development of new systems called PURE-WAYU as also photochip material for local dust control.